As the weather gets warmer, the last thing anyone wants is to spend it inside. We’ve been cooped up for months during the New Jersey winter — we just want to feel the sunshine! But while it might be a piece of cake for some of us to bounce out the door and fly down the steps to get to our backyards, millions of Americans can’t say the same thing. Mobility and ability vary for every single person — there’s no such thing as “normal.” But if you or a loved one are worried about those front porch steps, the outdoor stairs leading from the balcony to the backyard, or any other mobility issue, Able Care Group is here to help. We offer premier installations on indoor and outdoor technology, designed to make moving around safer, easier, and worry-free. Take a look at some of the mobility solutions we offer to provide access to the great outdoors this summer, and call Able Care Group to set up an installation! We’ll help you get the best in wheelchair ramps, vertical platform lifts, stairlifts, and elevators. Vertical platform lifts are great for providing access from one level of your home or business to the next. You can bypass the stairs completely by using a platform lift, and Able Care Group can install weatherproof ones that work outdoors! Vertical platform lifts are similar to elevators, and work well for someone using a wheelchair or a walker to get around. Instead of having to avoid the backyard or feel stressed out every time you need to check your mailbox, you can just ride safely and slowly on a vertical platform lift. We have other mobility solutions at Able Care Group, so we’ll happily come assess your property and listen to your needs to find the best solution for you. If you have an amazing second-story deck, you’re going to want to spend as much time as possible out there this summer. But you also will want to be able to safely maneuver the stairs to the first story/backyard, and that’s where an outdoor stairlift can help. We offer straight-rail and curved-rail stairlifts for the outdoors, which makes it easier than ever to get up and down those pesky stairs. If you have a cabin and are trying to get lake access without fearing for your life, an outdoor stairlift can be the perfect solution. Contact Able Care Group to get a free quote! Wheelchair ramps are not just for wheelchairs, though the name might lead you to believe otherwise. Ramps make walking outdoors much easier. Especially for people with limited mobility or who are recovering from a surgery, a wheelchair ramp is a safe option for getting out of the house. 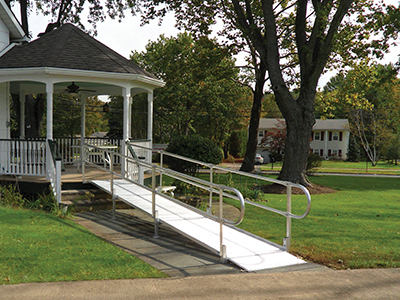 Able Care Group offers several types of ramps, such as aluminum, wooden, and steel ramps. However, we also can provide you with portable and threshold ramps, so that you can take this technology with you, wherever you go. Talk with one of our team members to find the best type of ramp, we’ll be more than happy to help! The outdoors should be enjoyed by all this summer (and every summer, for that matter). You shouldn’t have to sacrifice being outside — your home should absolutely adapt to fit your needs and to make mobility feel easier and safer. Able Care Group in New Jersey and New York has spent nearly 30 years providing the best in mobility assistance and technology for homes and businesses in the area. We are passionate about making mobility a right for all, and know that our vertical platform lifts, stairlifts, and wheelchair ramps can do just that. At some point or another, most of us will struggle with our mobility. We are committed to making sure that with our assistance, you won’t have to. Contact us today to get your home set up for the summer!